Diggers Valley: 30 November 2013. The week beginning the 30th of November 2013. 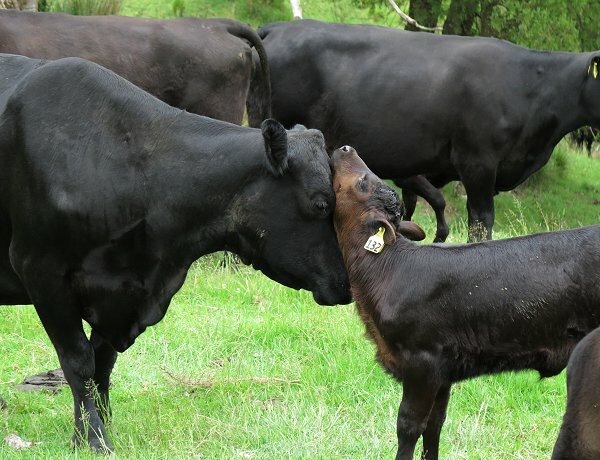 Demelza and Whatsername (have to find some names for some of these calves) were in the middle of the mob, gently head-butting, then face-licking, affectionately moving with each other. If we feel like that about each other, we call it love. I have no doubt they feel quite similarly in these moments, albeit without all the dreadful complications people add to their own stories. On the hillside Over the Road, I watched these two heifers for a while. 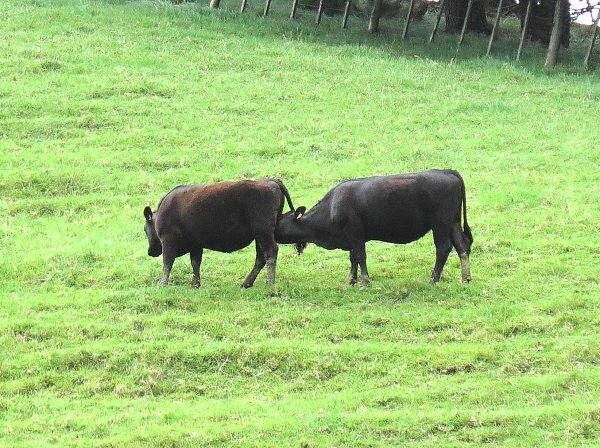 On-heat heifers will often behave in interesting ways, including licking around the udder areas of their herd-mates. Neither of them appeared to be in standing heat, but I'd bet one or both are about to be. The pasture has gone mad, springing out of the ground. After a slow start in the dry weather, the white-flowering Parsley Dropwort (commonly known around here as Carrotweed) has come up everywhere. At the stage of maturity pictured, the cattle will still happily eat it, but within a few days they'll be more inclined to leave it, as the flowers and their stems mature, growing larger and tougher to eat. It is at this time of year that the new slasher will come in handy, if we use it to mow down whatever the cows leave behind in such a paddock. 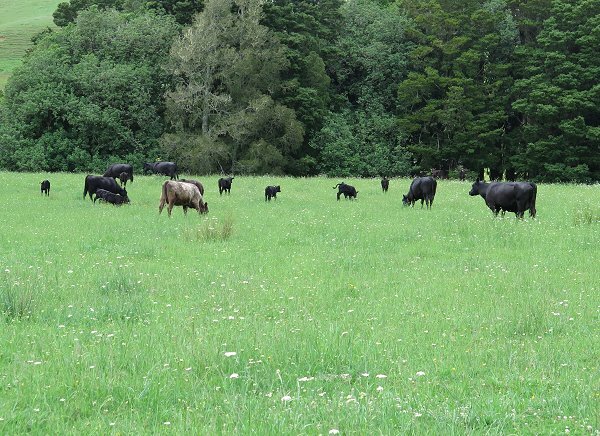 More learning opportunities for small calves: there are sticky little crossings and usual pathways all around the farm and it takes a little while for the new calves to learn their way around them. It's an interesting process to watch and they learn them very quickly, so that on their next sojourn in this paddock, they'll know exactly where to go and how to get there. Wanting to move them through the bottom gate (to the right of the picture) to the Back Barn Paddock, I needed to ensure these calves went across the boggy bit in the right place, to join the rest of the mob, before I moved any of them. Otherwise they'd have tried to go straight across the swampy bit further down and through the fence. Learning about going in the opposite direction to everyone else if that's where the gate is, comes much later. I gave most of the cattle mobs salt blocks today, since the Kikuyu is now actively growing. 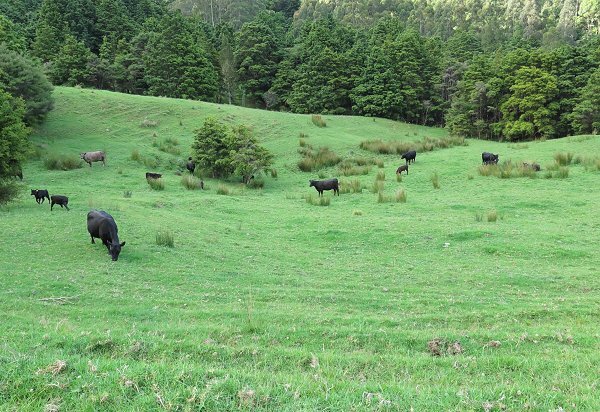 Kikuyu is natrophobic (doesn't take up sodium) so the cattle don't get very much in their diets and they do need some. I put one block down for the 20 cow mob and those who came to it first seemed keener to use it as a face-scratching implement than to lick it. Stephan went out to help someone move something big this evening and have a barbecue afterwards. I had to stay home, being on a far-past deadline for a magazine column. I find it difficult to keep up with everything I need to do during the exams! 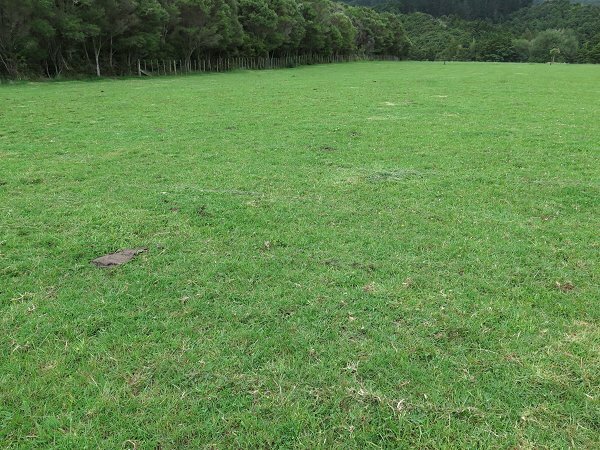 The grass out here looks much shorter than on the flats, but as it's Kikuyu and will be growing very quickly since the rain, it's very good feed for the cattle. They always seem to like this paddock. The exams finished after the end of this morning's session, so I packed everything away at school, sent all the unused materials back to NZQA, said my thank yous and good byes to all the people I've been working with for the last seven years, and came home. I'm mostly relieved; but I will miss my annual social interaction with a very nice group of people at the school, as well as a lovely group of supervisors. Perhaps I will invite them all out for a reunion lunch next year, as they suggested when Stephan fed them such a lovely lunch during the training session here before the exams started. 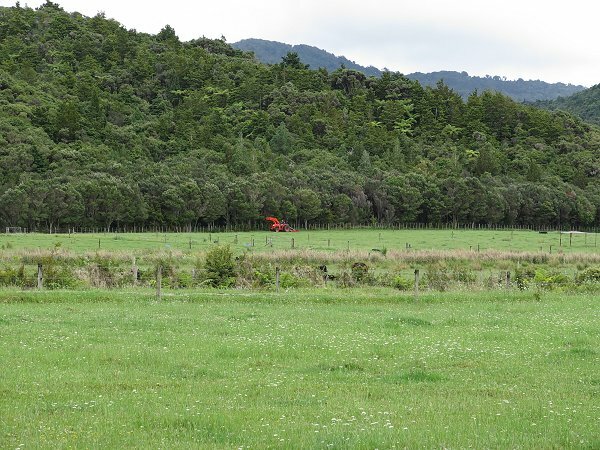 The cows having finished with Flat 4 (out of picture, to the left), Stephan took the tractor and slasher and mowed 5b and Flat 4. There's not much cut grass to see afterwards, but it tidies the paddock very nicely. It'll be fun to watch how it looks as the grass grows again. It's a long time since we've uniformly treated a paddock in this way. Today it rained, all day. It was a steady sort of fall, but there was a lot of it, enough to raise the streams so that we couldn't get the cows in this evening. 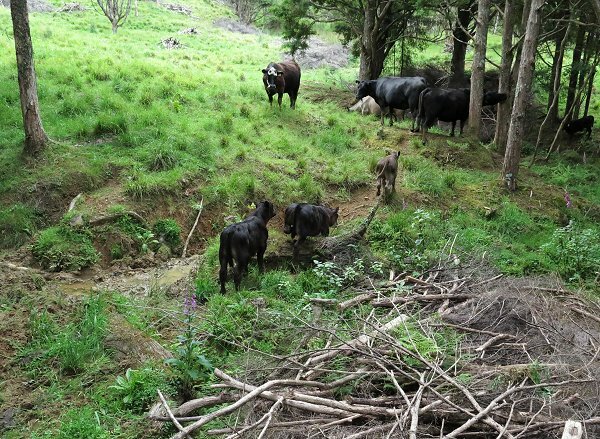 Imagen and Zella and their calves are grazing over at Jane's place and have to come across the stream to come home. The cows and calves were here in Flat 1 for three days. After I moved them out, Stephan came with the tractor and slasher. I was pleased to see that the slasher height is just right for missing most of the clover plants, but has cut down some thicker Kikuyu up this end and it's nice to see the rushes gone - for a while; I'll have to wipe the rest of them when they come up again. I had weed-wiped a few of them several weeks ago, so some were already dead. While Stephan was driving around and around the paddock, I was sitting in my office at a meeting in Wellington! It was my first experience of an on-line video-conference meeting and it was quite entertaining. It's not as though I sit in my office picking my nose when alone, but I was conscious that while I was sitting here, where I am usually entirely alone, anything I did could be seen by a gathering of nearly twenty women in a room in Wellington and a handful of others who'd joined from their individual spots around the country. The meeting was a Special General Meeting of the Women's Studies Association of New Zealand, called initially to wind up the organisation, but that call had brought a lot of other women to the fore who are prepared to contribute more actively than they have been, to its ongoing existence. I joined WSA in the early 90s, when I took the Certificate in Women's Studies through the Continuing Education Department at the University of Auckland. WSA has a primarily academic focus, but as a strongly feminist organisation, many of its members are non-academics out in community groups, or like me, individuals who wish to maintain a link with an organised feminist group. It is likely that in its next stage its non-academic links will become more important. Women's Studies departments in the Universities have been dumped, often after being diluted to "Gender Studies" and then disestablished altogether. Feminism has not, despite the opinion of some, done its dash; it has not passed its use-by necessity. If anything, society has regressed. If you're a feminist, consider joining the organisation. Membership is one thing which has kept my hope alive for the last couple of decades. I found it difficult to photograph this sheetweb spider-web well, partly because I wanted to convey its whole size. 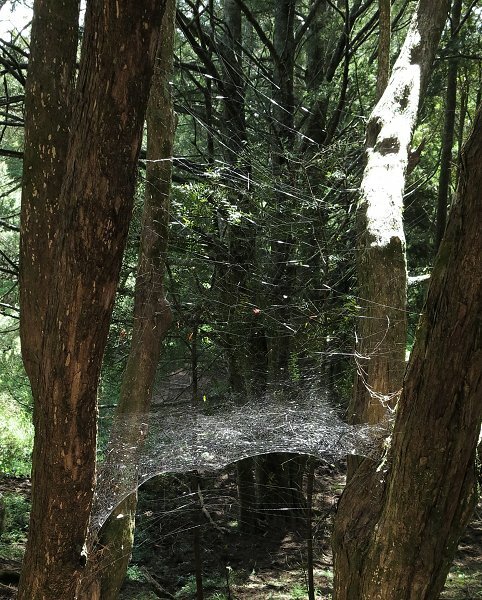 Apparently the spider waits for flying insects to go through the filaments above the main sheet, which causes them to falter and fall down onto the net below, where the large spider dashes out and catches them. The web isn't particularly sticky, it's more a set of physical barriers. It was a sheetweb spider which lived in our bathroom for several months. 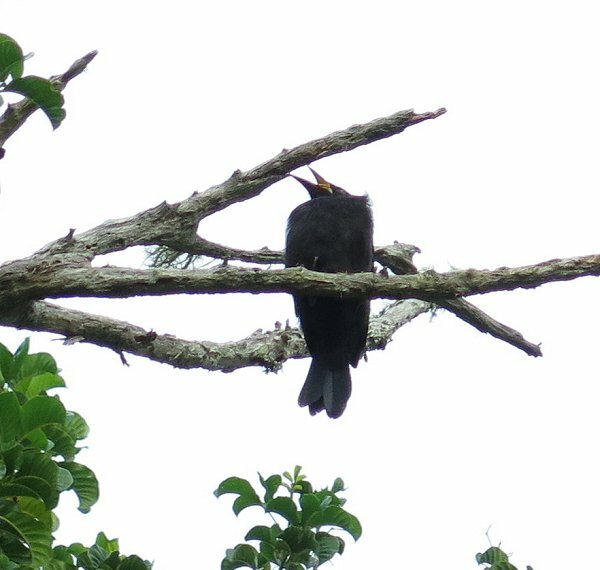 This morning when I went out to record the temperatures from the thermometer under the big Puriri tree, I heard what I assumed to be the first Pipiwharauroa (Shining Cuckoo) chick of the season, with its high-pitched, incessant peeping. But when I looked up to see if I could find the source of the calls, I saw a much larger bird and realised that while the pitch of the call was similar, the rate at which it was calling was quite a lot slower. 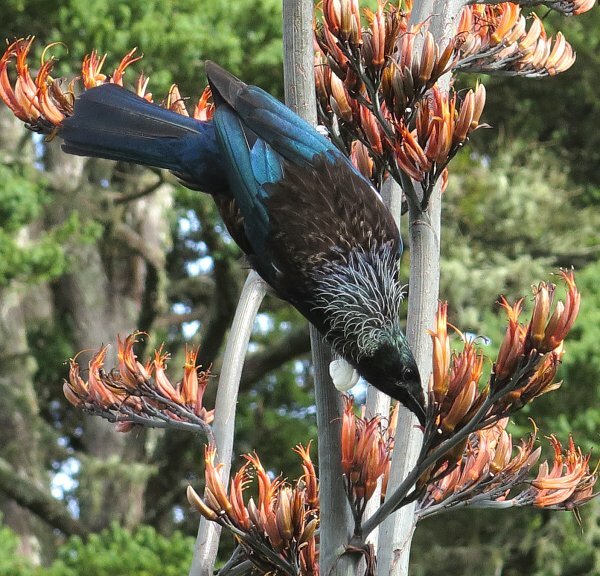 The bird was a fledgling Tui. 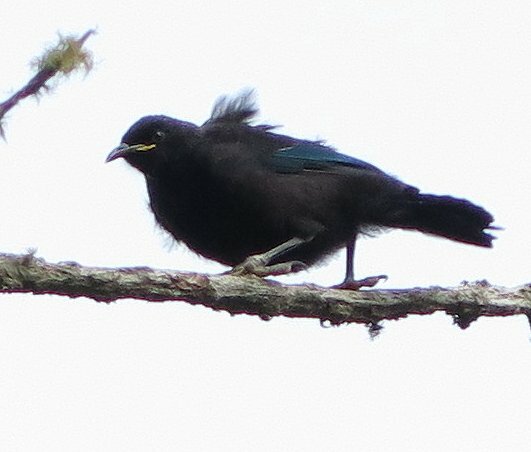 If I'd seen it out of the context of its relationship with its regularly visiting parent, I'd have thought it was a Mynah, one of those pesky Indian imports, whose bill colour is very similar in the corners of its mouth. Many times during the day I watched this bird, along with another - which might presumably be of the same family - being fed by a parent. Perhaps each parent bird was responsible for the feeding of one of the chicks. The parents were regularly in the flax flowers near the house, happy enough about my close proximity for me to get some reasonable photos. Once I watched the baby land in the flowers and attempt to feed as its parents do. For most of the day though, it perched high up in the Puriri tree and whenever it saw the parent returning, it made a different, squeaky sort of call. 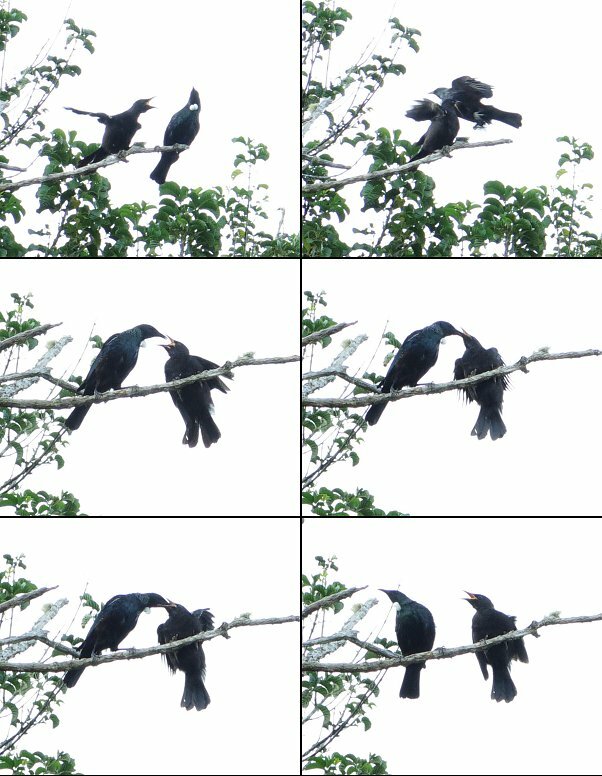 The parent bird's body language really amused me, before and after feeding. There appeared to be some very determined discipline in terms of who was in control of the feeding exchange. The fledgling can fly quite well, but I noticed that it doesn't seem to have fully-feathered wings yet. The outer flight feathers are all present, but the secondary feathers nearer the body are not yet all grown. I've only once ever seen a Tui nest in the trees and this is the first time I've seen a fledgling bird. I'm so pleased I noticed them. Outside my office window all day long, a hen blackbird hops around with an increasing load of earthworms in her bill, with which she eventually flies off in the direction of the river bank. One pair of birds appears to nest in the same place there every year. I worry about Finan hunting and catching them and wonder if there was a near-escape sometime in the last couple of weeks, because the female bird had no tail for a while. She's grown back some lovely new dark feathers again now.